A major feature of Numista is the opportunity for members to swap coins. This article will guide you through the swap process and will provide you with all you need to know to run the perfect swap. Always keep in mind that the main rule you should stick to is this one: communicate with your swap partner! You will figure out that this is the best way to get answers from other members and solve any trouble that may arise. For privacy purpose, no member name is shown in this article except our best partner in crime the Numista Demo account. In order to start a swap you first need to find a partner to swap with. Four options are available so you can find and select your swap partner depending on what you are looking for. This section shows you how to find your partner and land on his Exchange page so you can swap step-by-step using the following section of this article. If you already know the member you wish to swap with, go to his profile page and simply click on the view link next to the number of coins he has up for swap. Note that below the total number of coins your partner has in his swap list, two lines may give you information on the number of his swap coins that may interest you and on the number of your swap coins that may interest him. This data is related with the criteria you setup for your wish list. If you don't know yet who you wish to swap with, you may look for a member given specific criteria by selecting Start a swap within the Exchanges menu of Numista. 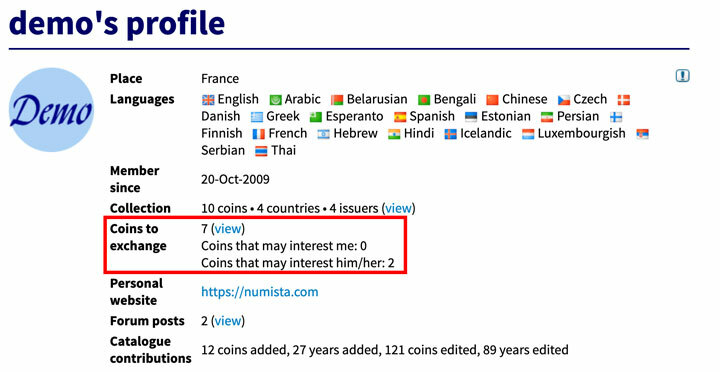 This will open a page named Numismatic exchanges with a list of all Numista members that you will be able to sort according to some criteria available. 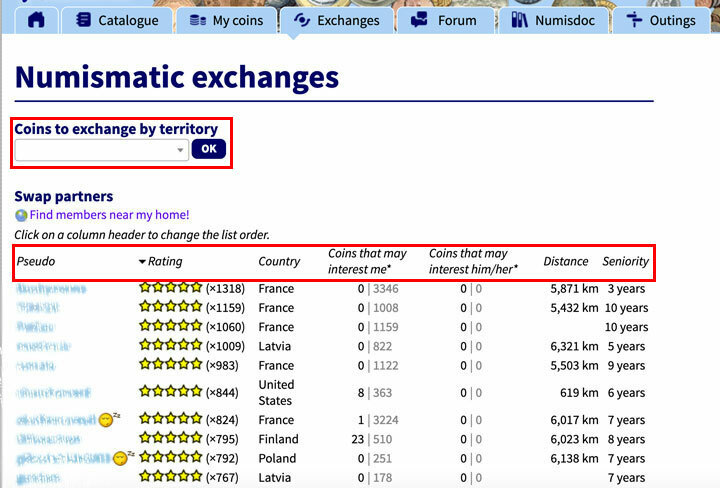 Coins to exchange by territory: You can select any issuing authority from this dropdown menu to look for coins from a specific country. This will open a page with all coins from this country that at least a member is willing to swap. This can be nice but will also give you a heavy list to go through. Pseudo: You can sort members alphabetically to look for a specific member or just find a funny username to try swapping with. The icon next to a pseudo means that this member does not want to swap at the moment, you may then want to skip him not to waste time. Rating: You can sort members by their ratings average. This can be useful if you want to swap with a partner having a specific rating rank. For instance you could choose to swap only with member having a perfect record (five yellow stars). Country: You can sort members by country of residence. This may be useful if you are looking for coins from a specific country or want to swap solely with partners from your country or a specific country. Coins that may interest me: You can sort members given the number of coins in his swap list that may interest you. The number at right corresponds to the number of types of coins in his swap list while the number at left corresponds to the number of coins from the right number that may interest you. For instance 3|132 means that 3 coins of this member may interest you over the 132 coins he has up for swap. Coins that may interest him/her: You can sort members given the number of your coins to swap that may interest him. The number at right corresponds to the number of types of coins in your swap list while the number at left corresponds to the number of coins from the right number that may interest the member. For instance 8|43 means that 8 of your coins may interest him over the 43 coins you have up for swap. Distance: You can sort members given the distance from you. This can be useful if you want to swap only with partners close to you or from a neighbouring area. Or the other way around if you want to swap with partner not in your area. Seniority: You can sort members given their seniority on Numista. This can be useful if you want to swap with partners who are around for a while and do not want to swap with new members (still try to give them a chance, we all had to start somewhere). On top of that you also have the ability to see members close to you by selecting the Find members near my home! link at top of the list of members. This will open a map that you may navigate through and find who you could swap with in your neighbourhood. Note that only 100 members are randomly shown on this page to avoid loading all members at once. To see more members, scroll down to the bottom of the page and click the Show more button below the last member shown. Below this Show more button, you will also be able to select the Show only members about who I wrote a comment link and see the list of members you already swapped with and rated. If you know the coin you want but do not know who to swap with to get it, go the page of the coin that interests you in the catalogue. When on the page, scroll down below the mintage section and you will find a list of all members willing to swap this coin (blurry part of the below picture). You may then select any of the member by clicking his pseudo. If you know precisely which variant of which coin you are looking for, go the page of the coin that interests you in the catalogue. When on the page, scroll down below the mintage section and you will find the same list as mentioned above gathering all members willing to swap this coin. Below this list, click the See details for each year/mintmark link. Once clicked, a detailed list will open in your browser showing you whose member wish to swap which variant of this same coin. You may then select any of the member listed for the variant you are looking for by clicking his pseudo. Above methods helped you to find your swap partner and brought you to his Exchange page. This page can be divided in two parts, first part being the information part and second part being the list part. The right block with the blue box shows you basic information about your partner, including his average rating, his number of swaps on the road and a link to his full profile. The top left block is a summary of coins you will select in the list part of this Exchange page and is also the place where you will come back to initiate your swap as explained further in this section. The bottom left part gives you indications on the meaning of small icons you will see within the list part. Depending on what you are looking for, you may also use this block to filter your partner's list a bit more. For instance you may want to select the icon to display only coins that are in your wish list and not be bothered with all other coins that are of no interest to you. Scrolling down the page will bring you to the second part, the list part as illustrated below. This part is where you will be able to select the coins you want from the partner's swap list. List will display four columns to show you the coin designation (grouped by issuer), the coin year, the coin grade and the number of this particular coin your partner has up for swap. Beside the grade of a coin in the list, you may see a icon. Hover your pointer over this icon and a small popup window will appear showing the public comment of your partner for this coin. If there is no icon, this means your partner did not enter a comment. On the same way, you will see a icon beside the year of the coin. 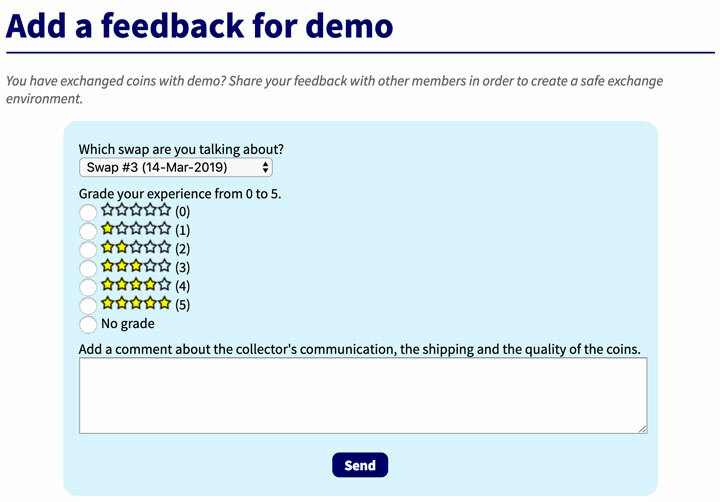 When hovering your pointer over this icon, a popup window will appear showing you the general comment of the mintage section that is displayed on the coin page itself. The coin page is accessible at any time by clicking the coin denomination in the left column of the list. Ending the coin denomination, you will see a icon. When hovering your pointer over this icon, pictures of the coin will appear. The pictures are not the ones of the coin from your partner, these are just the main pictures of the coin file. When looking at the above picture, you may notice that Costa Rica shows three lines but only the first one has a denomination. This means that both lines below are also about coins of the same type (i.e. 50 Céntimos - KM# 209 in the illustration) but are of other variants that you will be able to differentiate thanks to the columns year and grade. Note that while you don't see the top of the Exchange page, a small box is always displayed at top left corner of the browser. This is a mirror box of the top left box of the page with the summary of the total number of coins you want from this partner. To select a coin and add it to the swap, all you need to do is ticking the box at beginning of the line corresponding to the targeted coin. For illustrative purpose we will use the 20 Francs - Napoleon I - KM# 661 throughout the step-by-step process. 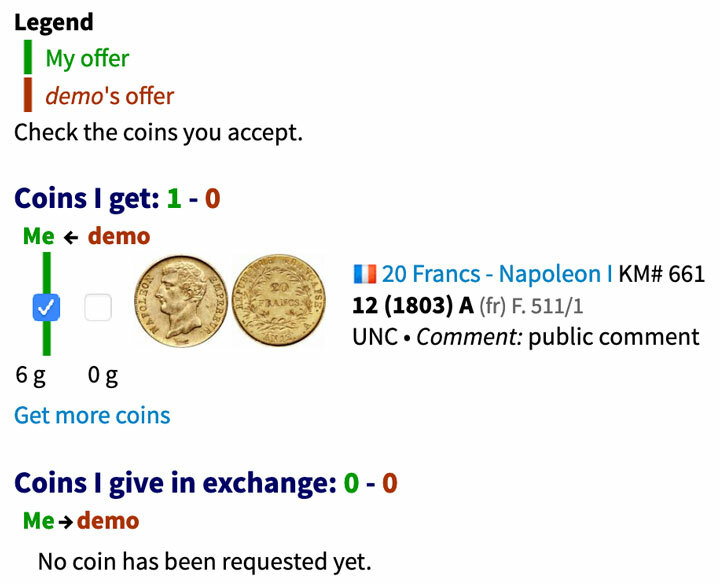 Now that you selected the coins you want, scroll back up to the top of the page and add them to the swap by clicking the OK button. You may also do this at any time by clicking the OK button of the mirror box mentioned earlier. Once you click the OK button as mentioned above, a swap page with your partner is automatically created. 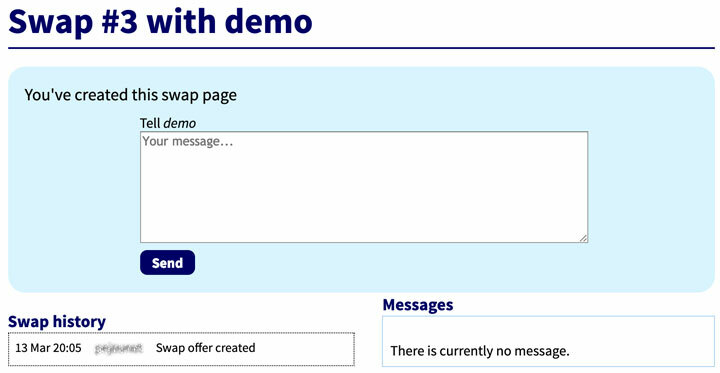 Upon creation of your page, an automated message is sent to your partner informing him about your willingness to swap but we still encourage you to write a personal note for him using the message box displayed at top of the newly created swap page. Be polite and friendly, it is always nice to receive some consideration rather than a pure automated message. The swap page on his side will be the exact same as yours except everything will be arranged from his point of view. For instance while your page will show the 20 Francs - Napoleon I - KM# 661 as a coin you get, your partner will see it as a coin he gives. The swap page can be divided into three parts: the history and message part, the action part and the swap offer part. First part of the swap page pictured below will allow you to follow-up, throughout the swap process, both your own actions and your partner's actions. The history part will be updated any time you or your partner update the swap page and the message part will be updated any time you or your partner send a message. Send a message - Obviously, to your partner. View profile - Of course, your partner profile. Confirm your swap - Don't click this link yet and read this note first. This option allows you to confirm the swap, meaning both you and your partner agree on the coins swapped and on the terms of your swap (who sends first, registered letter or not, etc.). Once clicked, this option CANNOT be undone on your side. If you confirmed by mistake, your partner still can reject your offer and both of you can start a new swap process. Once both you and your partner have confirmed the swap, this CANNOT be undone at all. Edit your collection - This option allows you to integrate the swap outcome into your collection. By clicking this link, coins you send will automatically be removed from your collection and at the same time coins you receive will automatically be added to your collection. I don't want to swap - This option allows either you or your partner to reject the swap for any reason (your partner does not want to swap, both of you do not agree on the swap terms, you changed your mind, etc.). Once a swap is cancelled, you cannot undo this action. View with Excel - This option will download an excel file on your device with the coins involved in the swap offer. Both the coins you get and the coins you send will be shown in this file. Hide in swap monitor - If the swap is rejected or cancelled, you may want to use this option so the failed swap does not appear in your swap monitor in between other successful or ongoing swaps. Refresh the page - Obviously when you make a change to the swap offer or take any action, you may want to refresh the swap page so changes are displayed. Finally, the third part of the page pictured below will display the coins involved in the swap and will reflect the evolution of the negotiation between you and your partner. Note that for now, you don't get any coins from this swap because your partner has not yet selected coins from your swap list that interest him. That is where the fun part of negotiation begins. Who sends first? - Even though it is not an official rule, a member with no swap completed or a low number of swaps will probably be required to send his coins first. This may also be required by your partner if you do not have ratings yet or if your profile shows a swap warning notice. This is up to you to discuss this with your partner. What type of mailing? - Depending on the country you send to and the value of the coins you send, you may require the mailing to be a basic tracked letter, a registered letter, a registered letter with insurance, etc. Members usually request registered letters or at least letters with tracking number. This helps tracking the coins, and partly prevents fraud or theft. What kind of packaging? - Depending on the coins value and on the partner, you may also want to discuss this point. Some members have high packaging standards and take real care of what they send to you. They will probably expect the same care from your side. Whatever the packaging is, you should always make sure that no sound is heard when shaking it before sending it. Otherwise this may be an easy theft clue for some bad people within the mailing channel. Who pays for the mailing? - This may seem tricky but depending on the value of the swap, the weight of the package, the country you are sending from or the country you are sending to, costs of mailing can vary a lot. You might want to clarify this beforehand. 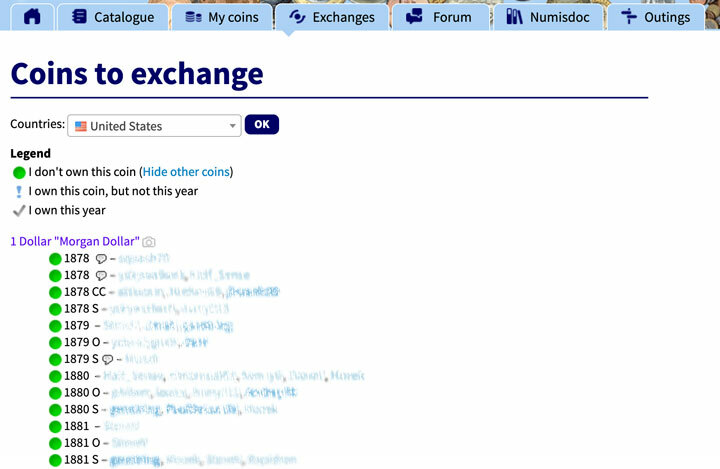 Now that your swap offer is on, your partner will be able to check your swap list through the See member's coins to exchange link displayed on his side and pictured below. From there, if nothing from your swap list is of interest to your partner he can simply reject the swap. Or if something of your list is appealing to him, he will select the coins from your swap list. Once he is done selecting, he will then proceed the same way as you did and will add the coins he wants to get from you to the swap. 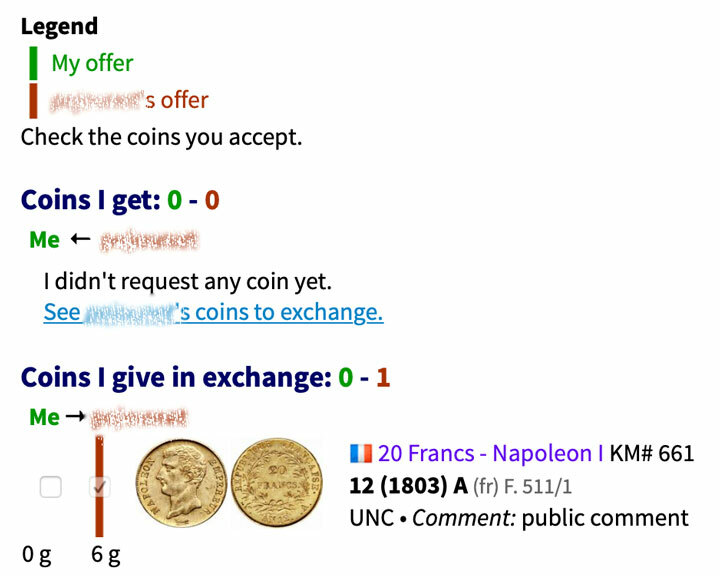 This action from your partner will at the same time update the swap history box at the top of the page and will also update the bottom part of the swap page where will now be displayed the coins part of his offer as pictured below. You may now click the Confirm my swap offer link from the Actions section. If your partner also agrees, he will also confirm on his side and the swap cannot be modified from now on and you may move to the next section about Closing the swap. Reject the swap - This may be a bit harsh not to try negotiating but it is your choice after all. Still we encourage you to send a note to your partner to let him know why. 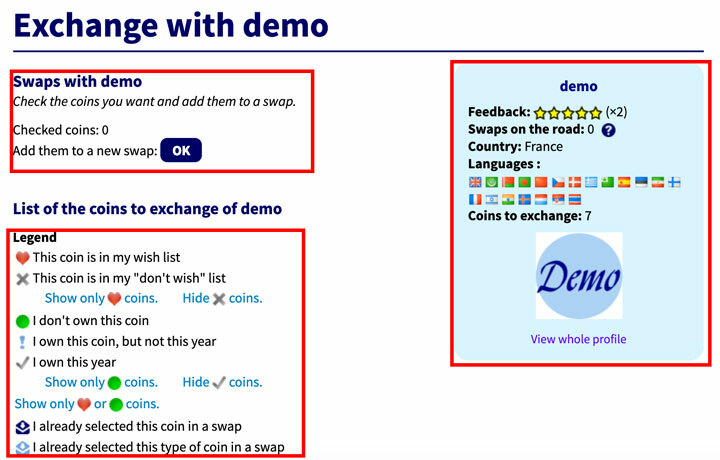 Refine the swap by selecting more coins from your partner's swap list - Click the Get more coins link below the coins you already want and add some more to the swap. 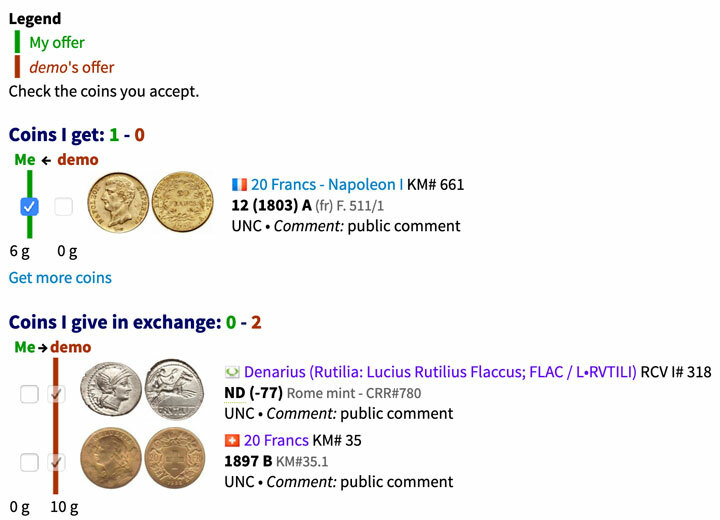 Ask your partner to remove some coins he wanted from his offer - As an example, we find in the case pictured above that swapping the 20 Francs - Napoleon I from France against the 20 Francs KM# 35 from Switzerland would be fair enough and that the Denarius: Rutilia from Roman Republic should not be added. Therefore we kindly message our partner to explain that and ask him to remove this coin from his offer. Our partner is fantastic and accepts, and pictured below is the result with the Denarius: Rutilia not selected anymore. This negotiating part of the swap can technically lasts as long as you and your partner want, meaning you and him can repeat several times the process of adding or removing coins from your respective offers. At all time both of you also have the option to terminate the swap by using the I don't want to swap link of the Actions section. Throughout the negotiation, it is highly recommended that you ask good pictures of the coins you want from your partner. And the other way around, it is recommended that you send good pictures of the coins your partner wants from you. This will help you both assess the quality of the coins and estimate the value of each coin to balance the global swap value. You may also have a look at the weight of the coins you will send and the weight of the coins you will receive; even though it is primarily for informative purpose, this may be helpful in determining the mailing type and the packaging required. Now that you are done with negotiating process and that both you and your partner agree on the coins, it is time to validate the terms (mailing, packaging, etc.) and close the swap. 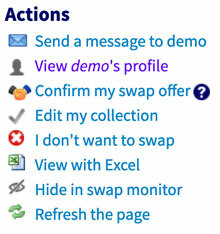 You may now click the Confirm my swap offer link of the Actions section. Your partner will then receive a note saying you confirmed on your side and he will be asked either to Accept or Turn down as pictured below. If he turns the offer down, the swap is cancelled. If he accepts, this closes the swap process and you are almost done. If you partner is the first to confirm the swap offer, you will be the one receiving the Accept or Turn down notification. Pack your coins correctly and as agreed with your partner. Make sure no sound is heard when shaking the package, so this may prevent theft from unscrupulous mailing service employees or intermediaries. Once you are all set, send your coins to your partner (depending on who should send first given what you agreed on with your partner). Do not forget to give the tracking number of your package to your partner so he can track the letter throughout its journey. Once you receive your new coins, you may come back to the Actions section of the swap page and click the Edit my collection link to automatically remove the coins you sent and add the coins you receive to your collection on Numista. Your swap is now technically done but there is still one thing you need to do: rate your swap! Now that your swap is completed and both members received their coins, you are required to rate the swap you completed. You will be able to do so through teh Actions section of the swap page where, now that the swap has been confirmed by both partners, a link Rate member has appeared; the member being indeed the pseudo of your partner as pictured below. While rating your partner, make sure you are rating him for the correct swap in case you have several swaps with him on the road or unrated yet. You may change this through the dropdown list at top of the rating box as pictured below. This is an important part of the swap as it allows members to maintain confidence with others by being able to see any member performance in swapping. When rating your partner, you will have to choose between six possibilities detailed further below. 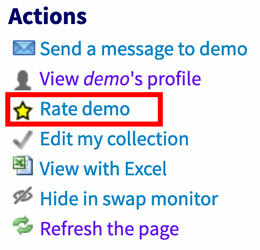 If your swap was cancelled or did not happen, do not rate it and just leave the said swap in the swap monitor without comment nor rating. If you receive a negative rating, you are able to reply to this rating through the swap page. There you may eventually explain what happened and why something went wrong. You are encouraged to reply to a negative rating, but keep in mind that a polite and reasoned reply is a must (it will also help other members to better understand your case). Don't be afraid to leave a feedback! If you feel the other member is not fair and gives you an unjustified negative feedback following yours, please contact an admin so the misleading feedback can be checked and eventually corrected. Numista rating system is based on the attribution of yellow stars ranging from no yellow star to five yellow stars. Below are explanations on what is implied for each rating level. : This rating is for a perfect swap. You had no issue with your partner, coins were as planned and package was received in a timely manner. : This rating is for a swap with minor troubles. For instance, one of the coin part of the swap was graded incorrectly (i.e. higher grade on paper than the one you received). : This rating is for a swap with basic troubles. For instance, you receive the coins in a perfectly sealed enveloppe but two or three coins are missing on the fifty coins you had agreed with your partner. : This rating is for a swap with major troubles. For instance, most of the coins never arrived or all coins were poorly graded (i.e. all coins supposed to be UNC and you received only F coins). : This rating is for a swap that has nothing good in it. Basically, this rating means your swap went wrong with way too long reception delays and that your partner had a really poor communication. : This rating is for a swap with worst case scenario. It means that you never received the coins, that your partner has a terrible communication and that he showed no effort to make it up to you. This is also the rating you would use to indicate your partner is a swindler. No Grade: This rating is for a swap with some troubles, that nobody could have planned and that are not your partner's fault (i.e. coins were lost by mailing service). But your swap partner is a friend and you consider him as an honest person, so you don't want to leave him a negative feedback. While rating your partner, do not forget to take into account the communications and general swap process. If coins were lost by mailing service but your partner sent you new ones, you probably will want to give him some fair rating by admitting he tried to fix the problem. All along the swap process, you are encouraged to discuss eventual troubles directly with your partner through private messages. If you do not get the coins you were promised, give your partner a chance to make it up to you. This could be either by sending new coins to you, or sending the equivalent value of lost coins to you in another way that would suit both of you. If you feel your partner is unfair, dishonest or refuses to discuss about a solution, give him an appropriate rating. Whatever happens during your swap, do not use the forum to express your concern or opinion by identifying and targeting your partner publicly, these kinds of messages will be deleted by moderators. In case a trouble arises that you are not able to solve with your partner, contact an administrator and explain your case so he can try to help you. Note that the responsibility of the swap is between partners of the said swap only and that Numista itself is not responsible for troubles. You may not ask Numista to pay you back for lost coins, packaging, mailing services, etc. However in case of troubles we may try to help you communicate with your partner to calm things down if it becomes a bit too heavy to handle for you.